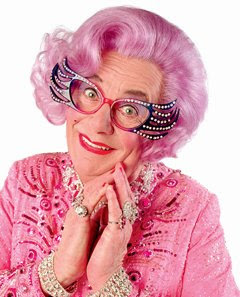 Dame Edna is funny, no doubt about it, but she really makes you appreciate Chris Rock. Clearly, there are only a few great comedians who can dominate a stage for an hour and a half or more, and they all do it with a combination of a unique personality and brilliant material. Barry Humphries, aka Dame Edna, tries to do it with his stage persona alone. Edna banters with the audience, she brings audience members on stage, she insults them and watches them react, she tosses them gladioli while singing a silly little ditty and she punctuates the show's opening, the opener to the second act and the finale with amusing videos. So if the audience just happens to be brilliant, the show might be brilliant, but if it isn't, and it probably isn't more often than it is, and God knows it wasn't yesterday -- then the show goes on 'way too long without much more than a few good laughs and quite a lot of giggles. Edna is a favorite with the San Francisco audience, as this is the town where she began her ascent in America, and there is lots of innuendo and one particularly wonderful song about her son Kenny, who appears to have many 'friends' here who all love opera and interior design. Edna shot off plenty of good ad libs, such as her comments about the "Nouveau Pauvre" -- that is, the people in the balcony who can't afford better seats -- as well as what she said to the 93-year-old woman in the audience who had been taken to the show as a birthday present: "Dear, you look a lot older than that." Think Don Rickles in drag, plus a brilliant ending video. Cheapest ticket: $68. It's up to you. The San Francisco Theater Blog Awards Division awards "Dame Edna: My First Last Tour" two stars with two BANGLES of Praise and one Bauble of Despair. It's the first time anyone has ever earned two BANGLES and less than three stars. This is because the act itself drags on too long to be worthy of more than two and a half stars, but the elevated ticket price eliminates that extra half a star. Edna is funny but she'd be a lot funnier at $30 in a night club with a two drink minimum. The first BANGLE of Praise is earned for the wonderful song "My Kenny" in which Humphries pulls off the hat trick: he rhymes 'state trooper,' 'CNN is super,' and 'Anderson Cooper.' The second BANGLE is for her comment when she is tossing her endless supply of gladioli into the crowd: "these gladdies were grown on my organic farm with my own manure." OK, that's the kind of humor you get with Dame Edna. We thought it was funny. The Bauble of Despair must be given to the jackass in back of this reviewer who began laughing before the curtain came up and continued through every single line for the first ten minutes. It wasn't a laugh, it was a donkey being put through a wood chipper. "Ladies and Gentlemen, the Post Street Theater is proud to..."
"HAW HYUK HARRR HOOOOT BZZZZZZZZZ HYAAAAAA!" "HAW HYUK HARRR HOOOOT BZZ BZZ BZZZZ HYAAAAAA!" And yet...he was gone, with not a few others, by intermission. So there you go. Two stars, two BANGLES, one bauble and one jackass. "Dame Edna: My First Last Tour"
It is rare when the curtain doesn't come up on an A.C.T. show to reveal a multilayered and complex set, usually with a huge staircase and glorious period furniture. Not this time. Jane Anderson's brilliant "The Quality of Life" opens on two chairs and a tree. Bill (Steven Culp) sits in one chair, Dinah (JoBeth Williams) in the other. Though their conversation is about traveling to California to see Dinah's cousin, the subtext reveals that their daughter, Cindy, has died in some terrible way, an event with which neither parent has been able to come to grips. At the end of this short opening sequence, Bill walks away and leaves Dinah crying in her chair. 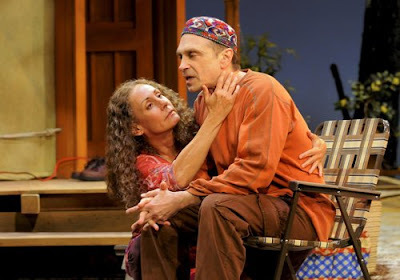 THEN, the curtain parts again and the true set is revealed: a fantastic yurt, somewhere in the California desert, into which cousin Jeanette (Laurie Metcalf) and her husband Neil (Dennis Boutsikaris) have moved after their home has burnt to the ground, and after Neil has been diagnosed with incurable cancer. Bill and Dinah arrive, and for the rest of the two-act 90-minute performance we are presented with an existential and often hysterically funny dilemma: under what circumstances is a dying man allowed to end his own life? Bill and Dinah have embraced Jesus after their daughter's death, so Bill, especially, is infuriated on religious grounds at Neil's decision to commit suicide. Dinah -- she's not so sure, even about God. 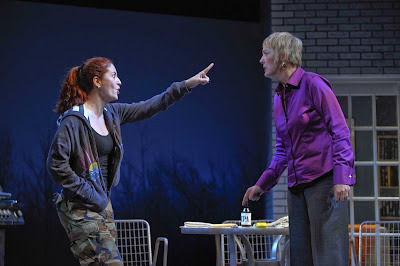 "I love the son, but I cannot STAND the father," she says, during an especially hilarious section where she has smoked some pot with Neil and Jeanette while Bill is in the bathroom. "Sacrifice his son in such a cruel way? What kind of a monster is that? Am I high?" The entire cast is first-rate. The two women steal the show, with Metcalf's Jeanette getting the funniest lines but Williams's Dinah allowed the most growth. We see raw suffering in every line of her dialogue, each slide of her knitting needles, even in the way she stands by herself, lost in thought. This is the kind of performance only a great actress can pull off. The ending is perhaps a little anticlimactic, but then again so is life. "The Quality of Life" is not about death, but about how we all choose to live. It's terrific. 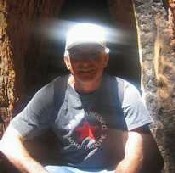 (Bill) "Would you like to accept Jesus Christ?" (Jeanette) "No thanks, I'm good." We would be looking at a four star production except for one nagging niggle: Neil, though dying of multiple cancers, was able to seemingly recover from his agonizing condition whenever he felt like it to deliver a perfect line or two. But others might not agree. Perhaps the point of the entire show is just this: life is messy and it doesn't always make sense. We feel "The Quality of Life" could have even been longer -- and you don't hear that often on this page. "Are we going to talk about the gun?" 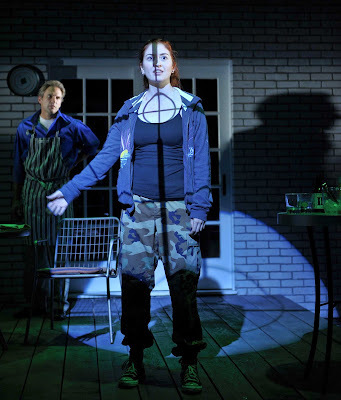 says red-haired, 16-year-old Evie, maybe ten minutes into the play, and from that moment on Carter W. Lewis's 'Evie's Waltz' becomes a parent's nightmare of nightmares. Evie is Danny's girl friend, and Danny is Gloria and Clay's son. Though we don't ever see Danny, he is the major player in this psychodrama, and his presence is constant, because Danny has hidden himself in the poison ivy thicket above the house, from which vantage point he is pointing a rifle at the barbecue area in his parents' backyard. This means that Evie, Gloria and Clay are in his gun sight at all times, which is an astonishingly good method to create tension. The kid is crazy. He could do anything. Danny has two ways to communicate: he texts Evie on her cell phone, or fires his rifle at the patio, causing everyone to run for cover. Danny has been suspended from school for carrying a gun to protect himself against school bullies, but it's not this gun, and he and Evie have a lot more to worry about than school. Marielle Heller is fabulous as Evie, a nuanced-but-unhinged teenager, and director (and Artistic Director of the Magic) Loretta Greco allows Evie to toggle emotionally back and forth, seeing herself one moment as a contentedly doomed Juliet and the next as a Columbine-style avenger. 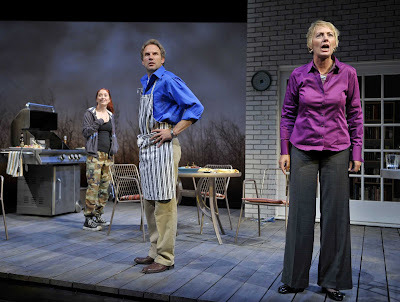 Although Julia Brothers's Gloria and Darren Bridgett's Clay make your skin crawl with their neurotic and cruel bantering, Brothers in particular slowly emerges as the focus on stage. She is the one who is trying the hardest to understand what's going on, whereas Clay is a conniving weasel and Evie -- well, Evie expects to die. The ending is fantastic theater, and it makes perfect sense. Prepare to be surprised and stunned. "Evie's Waltz" is a dance with the devil through the psyche of the modern family. You will find yourself wanting to scream at the three actors: "Get inside, for God's sake!" But you know they can't. They have to sit it out, like all of us in the audience, if there's ever going to be a chance of making things right again. 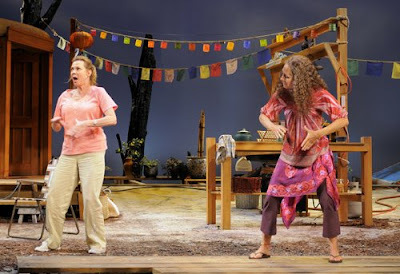 The San Francisco Theater Blog Awards Division awards "Evie's Waltz" Three and a Half Stars with a Bangle of Praise. Two stars are for the writing, because Carter Lewis exposes what every parent knows: the line between banal normality and unexplainable tragedy is very, very thin. Heller's Evie rates a full star all for herself, because we end up rooting for her even though we suspect we're going to regret it by show's end. Half a star is for Brothers's Gloria, though her husband Clay probably deserves part of it -- they are both so contemptible. The Bangle of Praise is for Sara Huddleston's sound -- man, when that gun goes off everything changes. And when it goes off again -- well, just you wait and see.